Your car’s interface has come a long way, but has a long way to go. 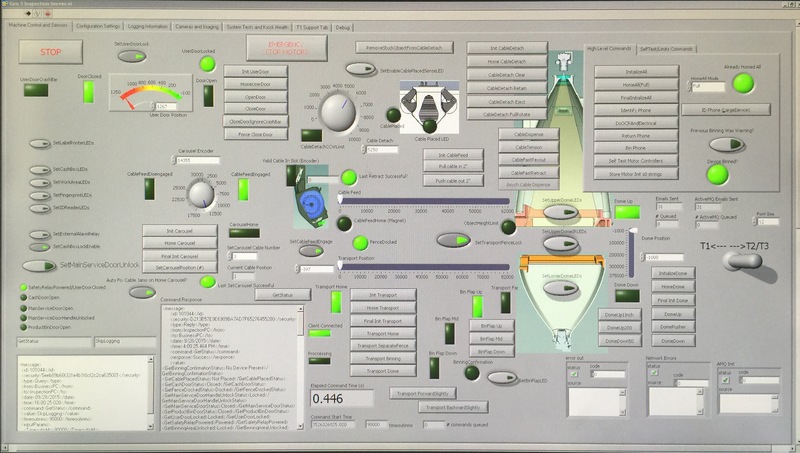 This is a picture of a dashboard/control panel that has been floating around the internet for a couple of weeks. Apparently someone shared a screenshot of what it looks like when accessing an ATM’s “Admin Panel”. I’ve kept this image on my desktop and occasionally open it just to stare and wonder about what the different levelers, buttons, and inputs do. I am especially intrigued by the bowling alley in the top right corner. Is there an animation playing there? Why do the gauges go from red to green instead of the more commonly used green to red. Honestly, looking at this image is a weird form of therapy – it’s an endless sea of options and settings and it baffles me. My brain locks up just trying to process how horrible it is. Luckily, user interfaces are rarely this bad. This made me think about how we automatically tie the terms “user experiences” and “user interfaces” to websites or apps. We are truly surrounded by unique user interfaces and experiences in almost every part of our lives: our alarm clock that wake us up, our coffee makers automating the coffee brewing task, the menus on our TVs, information boards at the train station, the credit card terminal, the list goes on and on. Is Your New Car Stuck in the Past? Last summer I bought a new Audi Q5. It’s a great car and I love it. It gets me from point A to point B reliably and in comfort. While I was spending the holidays with my family, I drove my dad’s car – which is also an Audi, only 10 years older – and I was amazed that nothing had evolved in their digital interface. In fact, everything about the user experience was exactly the same. I don’t need to tell you that 10 years is a long time in the world of technology. As an example, the cost of touch enabled screens have dropped significantly while their resolution and general quality have gone up. Now, I don’t think that making everything touch screen is a good idea (physical controls work better when you’re wearing gloves), but no evolution says something about the industry. This is absolutely baffling to me. I KNOW that there’s been a lot of effort, time, and money put into improving the engine, fuel consumption, and even things like the seats. Why isn’t the user interface considered just as vital to the success? Surely as our days are more saturated in technology, our perceptions change as well. What we found “good enough” only a couple of years ago now looks dated. While I was giving lectures at the University of Luleå in the very north of Sweden, I was invited to ride there with my good friend Patrick. He was shared with me the new digital dashboard on the Volvo he was driving. They allow the driver to customize the digital dashboard to better suit their taste and driving style. This is great from a user experience point-of-view, but there were a few things that irritated me about the user interface. Now, I’m not a typographic expert of any sort – just ask my wife! – but I can tell you that the kerning hurts the experience when the speedometer goes > 100 km/h. It doesn’t offer a great reading/viewing experience. When designing controls for a car, it is vital to have an easy input and a clear output. If I press a button, I should be confident of the result and I should receive a notification of some kind that my action was performed. Secondly, it is important to scale the difficulty of the tasks. Is it an easy task or a more complex one that will require more concentration? Turning up the volume on the radio or adjusting the heat are quick tasks, but finding someone in your contact list and calling them is a much more complex one. A great example of this is the digital dashboard that Audi is releasing on some models. This design is much like the Apple Watch as it is great for quick glances, but isn’t as efficient with longer engagements like switching music or browsing contacts. Lastly, who is performing the action? Actions that could be performed by the passenger shouldn’t have their visual feedback appear on the dashboard behind the wheel. Output, or the feedback that an action was successful, need to take different scenarios into account. Is the feedback visual like turning on the headlights? Is it a combination of visual and audio like using the blinkers? As cars move towards screen-based actions, are the tactile feedbacks still necessary? So, What’s the Next Evolution? I am looking forward to the time when we’ll see more actions that are voice controlled as that should translate to more accessibility and safety (as long as they work!). If, as anticipated, Apple builds their own car, I think it’s a pretty safe bet that it’ll be assisted by Siri. Asking her for directions to a place would be far easier – and safer – than using the input of most car controlled GPS systems! She would be able to call someone or play a specific song far easier than through a (visual) user interface and simplify that complex task. Wouldn’t it be nice to just ask Siri for a faster way home and have her reroute you around traffic jams? Ultimately, it doesn’t matter how many fancy digital dashboards you have, it doesn’t really matter until you solved the basic user interaction problems. While they may seem trivial, like the kerning on a Volvo dashboard, they’re in need of solutions. The automotive industry is starting to catch on to how important user interactions are, but there are many industries that haven’t started their transformation yet.